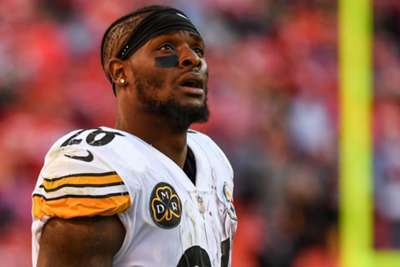 Le'Veon Bell bid farewell to Miami in a cryptic tweet on Monday, hinting that he could soon be on his way back to Pittsburgh. The Steelers running back, who is seeking guaranteed money, has forfeited more than $7million during his holdout after being tendered for the second straight year. Bell remains absent despite reports that he was going to rejoin the Steelers during their Week 7 bye. He will have to end his holdout in order to accrue an NFL season, which would make him eligible for unrestricted free agency after the 2018 season. The November 13 deadline for him to sign his tender falls during Week 11, when the Steelers are scheduled to visit the Jacksonville Jaguars in a rematch of last year's divisional round playoff game. Meanwhile, Steelers coach Mike Tomlin has made it clear that Bell is not a concern, saying the team "needs volunteers, not hostages." The Steelers (5-2-1) will look to extend their winning streak to five games when they host the Carolina Panthers (6-2) on Thursday.